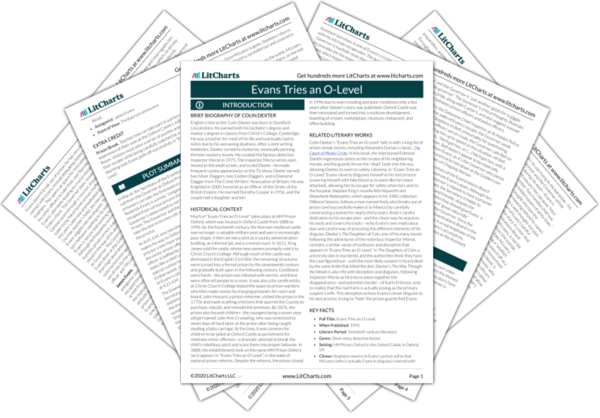 Instant downloads of all 942 LitChart PDFs (including Evans Tries an O-Level). Welcome to the LitCharts study guide on Colin Dexter's Evans Tries an O-Level. Created by the original team behind SparkNotes, LitCharts are the world's best literature guides. A concise biography of Colin Dexter plus historical and literary context for Evans Tries an O-Level. A quick-reference summary: Evans Tries an O-Level on a single page. In-depth summary and analysis of every of Evans Tries an O-Level. Visual theme-tracking, too. 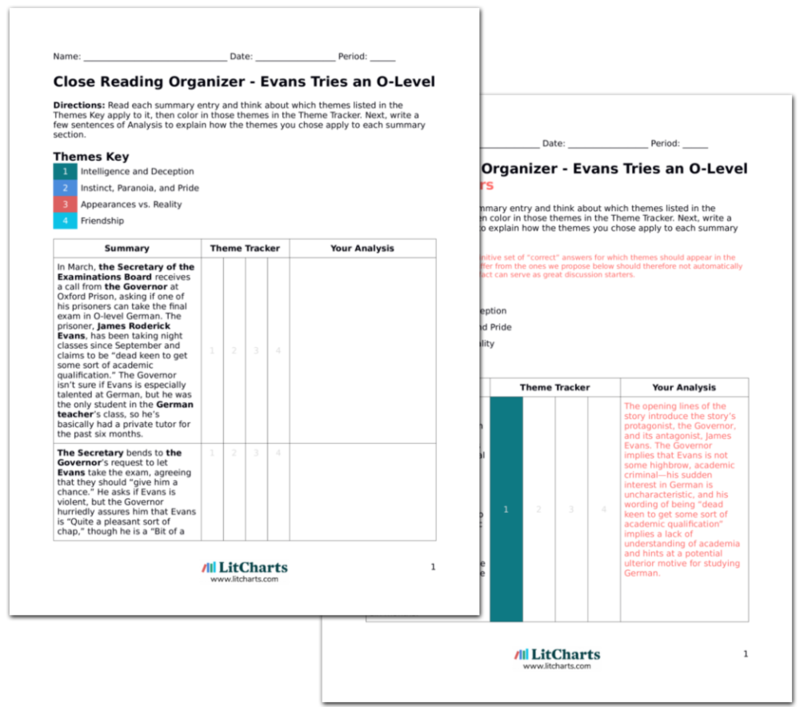 Explanations, analysis, and visualizations of Evans Tries an O-Level's themes. Evans Tries an O-Level's important quotes, sortable by theme, character, or . Description, analysis, and timelines for Evans Tries an O-Level's characters. Explanations of Evans Tries an O-Level's symbols, and tracking of where they appear. An interactive data visualization of Evans Tries an O-Level's plot and themes. English crime writer Colin Dexter was born in Stamford, Lincolnshire. He earned both his bachelor’s degree and master’s degree in classics from Christ’s College, Cambridge. He was a teacher for most of his life and eventually had to retire due to his worsening deafness. After a stint writing textbooks, Dexter turned to mysteries, eventually penning thirteen mystery novels. He created the famous detective Inspector Morse in 1975. The Inspector Morse series soon moved to the small screen, and so did Dexter—he made frequent cameo appearances on the TV show. Dexter earned two Silver Daggers, two Golden Daggers, and a Diamond Dagger from The Crime Writers’ Association of Britain. He was knighted in 2000, honored as an Officer of the Order of the British Empire. He married Dorothy Cooper in 1956, and the couple had a daughter and son. 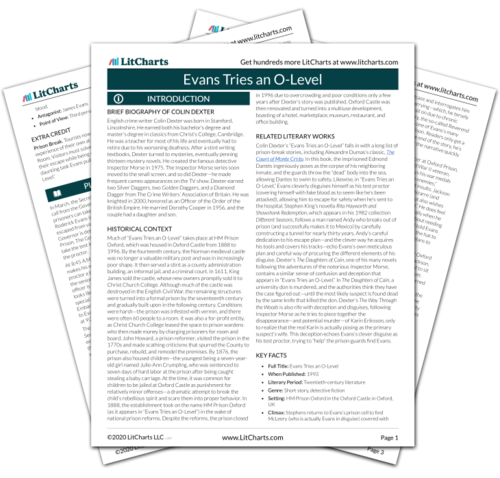 Get the entire Evans Tries an O-Level LitChart as a printable PDF. Much of “Evans Tries an O-Level” takes place at HM Prison Oxford, which was housed in Oxford Castle from 1888 to 1996. By the fourteenth century, the Norman medieval castle was no longer a valuable military post and was in increasingly poor shape. It then served a stint as a county administration building, an informal jail, and a criminal court. In 1611, King James sold the castle, whose new owners promptly sold it to Christ Church College. Although much of the castle was destroyed in the English Civil War, the remaining structures were turned into a formal prison by the seventeenth century and gradually built upon in the following century. Conditions were harsh—the prison was infested with vermin, and there were often 60 people to a room. It was also a for-profit entity, as Christ Church College leased the space to prison wardens who then made money by charging prisoners for room and board. John Howard, a prison reformer, visited the prison in the 1770s and made scathing criticisms that spurred the County to purchase, rebuild, and remodel the premises. By 1876, the prison also housed children—the youngest being a seven-year-old girl named Julie-Ann Crumpling, who was sentenced to seven days of hard labor at the prison after being caught stealing a baby carriage. At the time, it was common for children to be jailed at Oxford Castle as punishment for relatively minor offenses—a dramatic attempt to break the child’s rebellious spirit and scare them into proper behavior. In 1888, the establishment took on the name HM Prison Oxford (as it appears in “Evans Tries an O-Level”) in the wake of national prison reforms. Despite the reforms, the prison closed in 1996 due to overcrowding and poor conditions only a few years after Dexter’s story was published. Oxford Castle was then renovated and turned into a multiuse development, boasting of a hotel, marketplace, museum, restaurant, and office building. Colin Dexter’s “Evans Tries an O-Level” falls in with a long list of prison-break stories, including Alexandre Dumas’s classic, The Count of Monte Cristo. In this book, the imprisoned Edmond Dantès ingeniously poses as the corpse of his neighboring inmate, and the guards throw the “dead” body into the sea, allowing Dantes to swim to safety. Likewise, in “Evans Tries an O-Level,” Evans cleverly disguises himself as his test proctor (covering himself with fake blood as to seem like he’s been attacked), allowing him to escape for safety when he’s sent to the hospital. Stephen King’s novella Rita Hayworth and Shawshank Redemption, which appears in his 1982 collection Different Seasons, follows a man named Andy who breaks out of prison (and successfully makes it to Mexico) by carefully constructing a tunnel for nearly thirty years. Andy’s careful dedication to his escape plan—and the clever way he acquires his tools and covers his tracks—echo Evans’s own meticulous plan and careful way of procuring the different elements of his disguise. Dexter’s The Daughters of Cain, one of his many novels following the adventures of the notorious Inspector Morse, contains a similar sense of confusion and deception that appears in “Evans Tries an O-Level.” In The Daughters of Cain, a university don is murdered, and the authorities think they have the case figured out—until the most likely suspect is found dead by the same knife that killed the don. Dexter’s The Way Through the Woods is also rife with deception and disguises, following Inspector Morse as he tries to piece together the disappearance—and potential murder—of Karin Eriksson, only to realize that the real Karin is actually posing as the primary suspect’s wife. This deception echoes Evans’s clever disguise as his test proctor, trying to “help” the prison guards find Evans. Climax: Stephens returns to Evans’s prison cell to find McLeery (who is actually Evans in disguise) covered with blood. Weeks, Rachel. "Evans Tries an O-Level." LitCharts. LitCharts LLC, 13 Nov 2018. Web. 11 Dec 2018. Weeks, Rachel. "Evans Tries an O-Level." LitCharts LLC, November 13, 2018. Retrieved December 11, 2018. https://www.litcharts.com/lit/evans-tries-an-o-level.